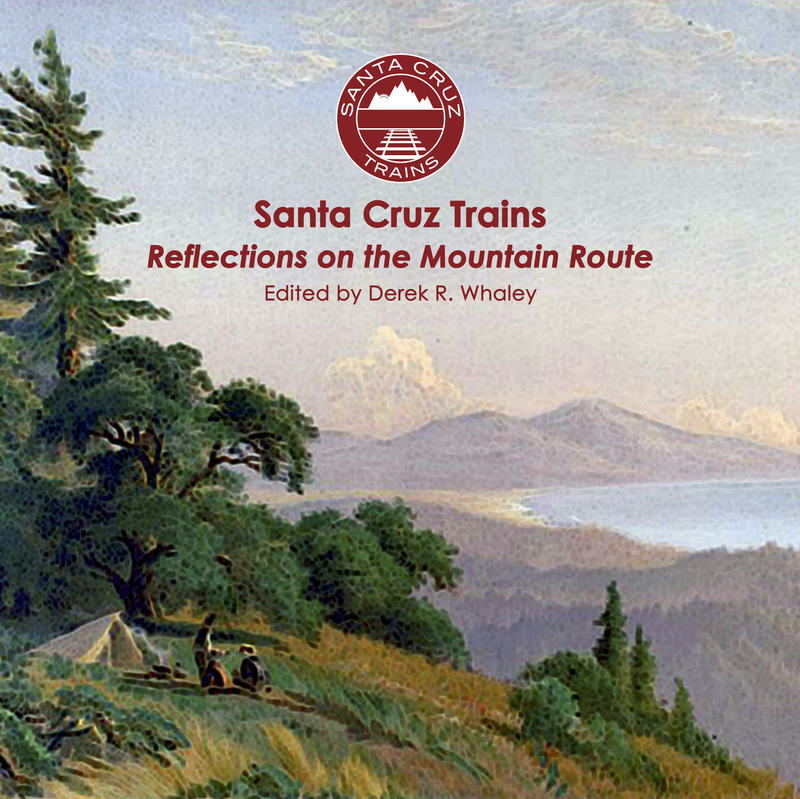 Just west of Clems along the former railroad route between Los Gatos and Santa Cruz, the South Pacific Coast Railroad bored a short tunnel beneath Mountain Charlie Road, the former main highway between Lexington and Scotts Valley. At 913-feet-long, Tunnel 4 was unremarkable to the people who built it in 1878. The tunnel was constructed by Osborn & Company at the same time that the Glenwood and Summit tunnels were under construction. It opened to through traffic on Christmas Day, 1878, although it would be another year before tracks were installed by Muer & Redfield. The tunnel walls were composed largely of sandstone, which meant that the chance of cave-in was high. Closely-placed redwood bents and beams were installed along its entire length, with strong redwood portals on either side. About 300 feet of the western portal, above Bean Creek, Clem & Company eventually had a stop installed. About the same distance from the eastern portal, above Mountain Charlie Gulch, the Virginia Timber & Milling Company installed a stop. Both stops supported a siding that allowed trains to wait outside the tunnel, although more standardized systems were in place to avoid such problems. Unfortunately, no photographs of the original tunnel seem to exist. The tunnel did not sustain significant damage during the 1906 San Francisco Earthquake but it was nonetheless standard-gauged two years later by the Southern Pacific Railroad. The interior of the tunnel was widened to support larger trains, with all the support structure being replaced with more evenly-spaced redwood bents and beams. The sandstone walls and ceiling proved incredibly stable, so less support was required inside the bore. On either side, new concrete portals were installed, both of identical design with tall concrete buttresses angled toward the right-of-way on either side of the entrance itself. Because of the remoteness of the tunnel and how far below Mountain Charlie Road it was situated, no railings or other protective devices were installed. However, a guard rail was installed along the track throughout the tunnel to mitigate damage caused by derailments. The railroad renumbered it Tunnel 3, since the tunnel on Los Gatos Creek (Tunnel 1) was daylighted during the upgrading of the track. Photographs taken from 1940 show that the tunnel repair car was stationed outside the western portal beside a small supply shack. 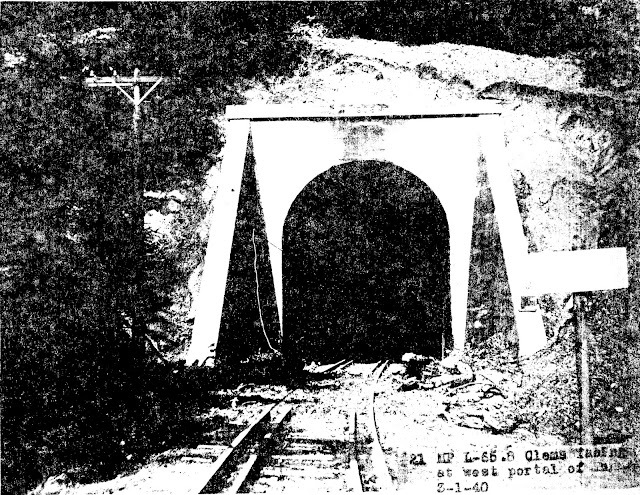 As with the Summit and Glenwood tunnels, Tunnel 4 was abandoned in November 1940, after disastrous storms in February of that year disabled the route. After Southern Pacific crews went through to pull the rail in mid-1941, H.A. Christie & Sons was hired to remove the timber from the tunnel and seal the portals. Charges were placed and the portals closed in April 1942 with assistance from the Army Corps of Engineers. Due to the nature of the concrete portals, the explosives were detonated about 15 feet within the portal, just beyond the reach of the concrete and brick ceiling. Unlike all the other demolished tunnels along the line, the Mountain Charlie Tunnel defied its closure. The demolition of 1942 collapsed the ceiling completely just inside the eastern portal, but this inadvertently caused the sandstone ceiling to weaken within the tunnel itself. By at least the 1970s and probably earlier, a hole had appeared above a portion of the tunnel, accessible to people climbing over the eastern portal. Over the years, this hole enlarged until the entire right-of-way within the tunnel was accessible to daring explorers. People who have explored the interior have found that much of it remains intact, with human-sized piles of sandstone scattered throughout but the walls and ceiling otherwise still holding firm to their original dimensions. Access to the interior was finally cut off in February 2011, after runoff from a powerful winter storm caused a small landslide that filled this hole. 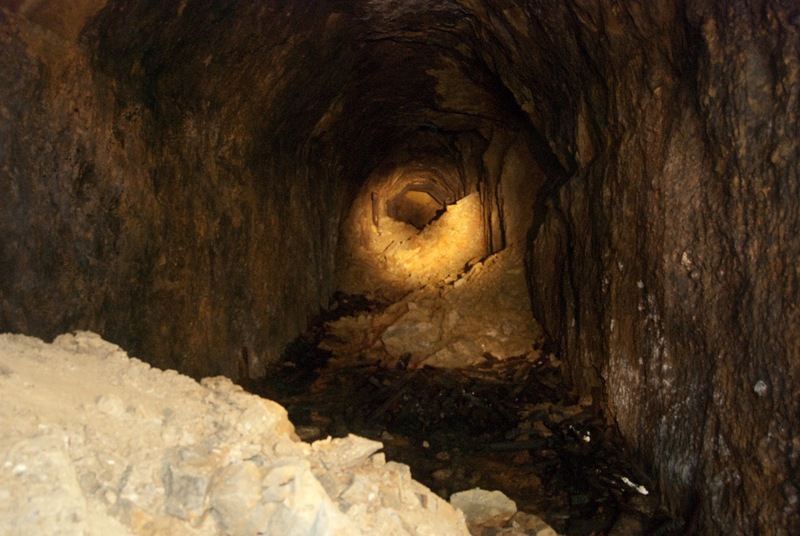 Although neither portal of the Mountain Charlie Tunnel can be accessed legally, the eastern portal can be approached with relative safety since it is located on Santa Cruz Water District land and rarely patrolled. The easiest way to reach it is via the fire road located at the point where East Zayante Road becomes Upper Zayante Road. The switchback fire road ends at the right-of-way, at which point explorers should turn east and follow the former railroad grade. Warning: there are three gates that must be hopped to reach this portal. Just after the third gate, there will be a private driveway that crosses the grade, walk across the driveway (do not follow it) and the path will quickly become overgrown. Just when you think you have somehow missed the turn, you will encounter the portal in all its glory. The western portal is now on private property protected by a security gate. Trespassing without permission is not advised. Unlike any other portal along the line, this one is almost freestanding since the sandstone hillside behind it has eroded substantially over the years. A number of small trees are now growing just outside the portal. Ausbuchon, Vaughn. 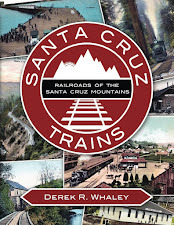 "Santa Cruz, CA Railroad Tunnels." California Nostalgia: History Summaries. This is great. When we get good scans of Duncan Nanney's 1940 photos of the tunnel entrances just after closure the line, that will be a great addition to the page. What are those white stuff at the end? What white stuff at the end? Thanks for the explanation about the tunnel getting sealed in 2011. I visited this tunnel entrance last week and it was sealed. I remembered coming for the first time in 2009 or 2010 and being able to climb a ways in, but now that doesn't seem possible. I was just talking to a friend of mine. His parents lived off Hiway 17 west of the summit and the house was built with timbers from the tunnel off glenwood road. I expect this page will be revised in the coming weeks, and the confusion will only get worse in the identification of tunnel portals. Southern Pacific only had east and west, with everything heading towards San Francisco considered westbound and given an odd train number in the schedule. A tunnel portal will be labeled as west if it were closer in route distance to SF: the portal at Wright, for instance, is the west portal to the Summit Tunnel. Expect all references to north and south to be gone from the articles with the railroad network scheme as the necessary replacement. Problems become compounded when lines are broken and mergers happen, and when those who are unaware add their own comments straight to the photographs (the 1940 storm damage photos seem to have a few problems, I believe). Stay tuned for an update in two weeks (second Friday of April). The coordinates for the Eastern portal are in error - 37.101˚N, 121.000˚W is near the O'Neill Forebay. the photos we selected to copy came out clearer than mine. I hoped to look at this binder again but by that time Mr. Blair was late in years and was too confused to find the binder again. I have since learned there is at least one other binder still in existence with these photos. The 1940 photos are part of an odd survey: a large rain event and we have mostly clear photos of the tunnels, when trestle supports should have been the subject. While I've seen the washouts, and where the tracks are out of alignment, someone seems to have been instructed to simply photograph the landmarks. If text is available from the petitions, it might be a little more enlightening to scatter it around. It is a furor among numerous individuals from this source to go for a mountaineering trip in various bumpy areas of the world.